Joey is originally from Kapa‘a, Kauai. He is a junior/senior at the University of Hawai‘i Maui College pursuing a Bachelor of Applied Science degree in Engineering Technology. 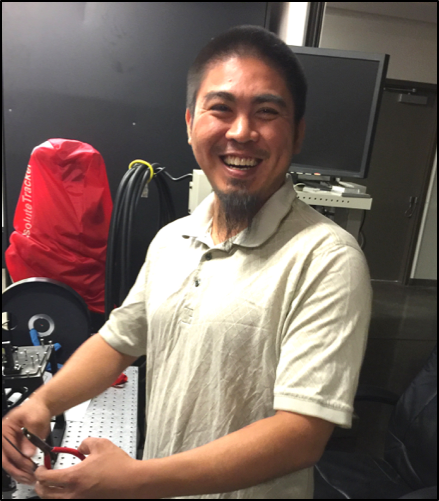 Upon completing his degree, Joey would like to use his acquired knowledge to help the people of Hawai‘i through technological innovation. A major goal that he would like to accomplish is building a local startup, and using that startup to give back to the local people of Hawai‘i through education in technology. He would like to further his education by getting a master’s degree. In his free time, Joey enjoys pig hunting, surfing, and spending quality time with friends and family. The Daniel K. Inouye Solar Telescope (DKIST) will be housing a Cryogenic Near Infrared Spectropolarimeter (Cryo-NIRSP) instrument to study solar coronal magnetic fields over a large field-of- view and at near- and thermal-infrared wavelengths of 1000 nm to 5000 nm. A major component that resides within the Cryo-NIRSP instrument is the beam-splitter/analyzer (BSA) system which first linearly polarizes light from a modulated source, and uses a detector to compare the values of the two polarized beams created. To perform this function properly, the BSA system requires a relative accuracy of 10 -4 meters. The purpose of this project is to assess a subset of BSA system components for defect tolerances on a variety of optimal performance measures, including polarization contrast and throughput, before being implemented into the completed design. Specifically, I will characterize the BSA’s reflective wavefront performance of an externally reflective prism, plano-mirrors, and wire-grid polarizers. I will use a Zygo interferometer, Cary spectrophotometer, lab spectropolarimetric setup and associated cameras to perform the optical tests. If necessary, I will design and construct additional apparatuses and experimental setups in order to complete the required tests on the BSA system components. Results from my tests will be used to evaluate the ultimate performance of the BSA subsystem in Cryo-NIRSP.